Can you just ignore those collection notices? If you default on a credit card, loan, or even your monthly internet or utility payments, you run the risk of having your account sent to a collection agency. These third-party companies are hired to pursue a firm's unpaid debts. You’re still liable for your bill even after it's sent to a collection agency. Many people don’t want to pay collection agencies, perhaps because, other than ending debt collection calls, there’s no immediate benefit for paying off the debt. However, before you decide not to pay off a debt in collection, make sure you know the consequences of ditching the outstanding balance. Debt collectors report accounts to the credit bureaus, a move that can impact your credit score for several months, if not years. Your credit score will drop and may have already done so if the unpaid amount is for a credit card or loan. The late payments and subsequent charge-off that typically precede a collection account will have already damaged your credit score by the time the collection happens. While paying a collection notice isn't the most exciting thing to do with your money, you do receive some benefits from paying off the delinquent amount. You can get the collectors to stop hounding you, and a paid collection looks better on your credit report than an unpaid one, particularly when it comes to getting new credit. It's worth reviewing your credit report periodically for any account collections that might not really belong to you, but if the collection is legitimately yours, it's typically better to pay it and be done with it. A debt collector’s job is to get you to pay your debt. Often, collectors don’t make a profit unless they collect the full amount of the debt from you. You can expect constant phone calls and letters from debt collectors until you pay up. Fortunately, you can stop debt collector calls by writing and asking them to stop calling. Beware, because some debt collectors ignore the law and continue calling anyway. Collection agencies are typically assigned a debt for a few months. If they haven't gotten you to pay in that time, a new collection agency may take over the debt. The process repeats several times, possibly over several years until you finally pay up. Because the debt gets passed around from one collector to another and they don't share records, you'll probably have to send a new cease-and-desist letter to stop the calls or a new debt validation letter to force each collector to prove you owe the debt. Debt collections are a serious delinquency and signal to other creditors and lenders that you haven’t always kept your payment promises. You’re deemed a riskier borrower, and because of that, some of your applications for new credit may be turned down. You're especially likely to be turned down for a mortgage if you have unpaid debt collections on your credit report. Whether you pay the collection or not, it stays on your credit report for the entire credit reporting time limit. Then, when that time period elapses, the collection will fall off your credit. You'll still owe the debt and the collector can still come after you, but your credit report won't show the debt any longer. Not all applications are denied because of a collection on your credit report. You might be approved, but you'll be required to pay a higher interest rate to compensate for the increased risk of nonpayment. Other services, like smartphone or cable services, may require you to pay an upfront security deposit. On a positive note, you'll get your deposit returned or credited to your account as long as you pay on time each month. It doesn't seem right that prospective employers should have access to something private like your credit report. Unfortunately, some employers now check credit reports on potential employees for various reasons. Having a collection on your credit report can keep you from getting hired, especially with financial jobs or upper-management-level jobs. Many people think collectors won’t sue for debts over a certain amount, but truthfully, collectors can sue you for a debt of any amount. If the creditors get a judgment against you, they could also ask the court to garnish your wages to enforce the judgment. Don’t ignore a lawsuit summons, even if you believe the statute of limitations has passed on your debt. If you’re sued, consult an attorney on the best way to proceed. 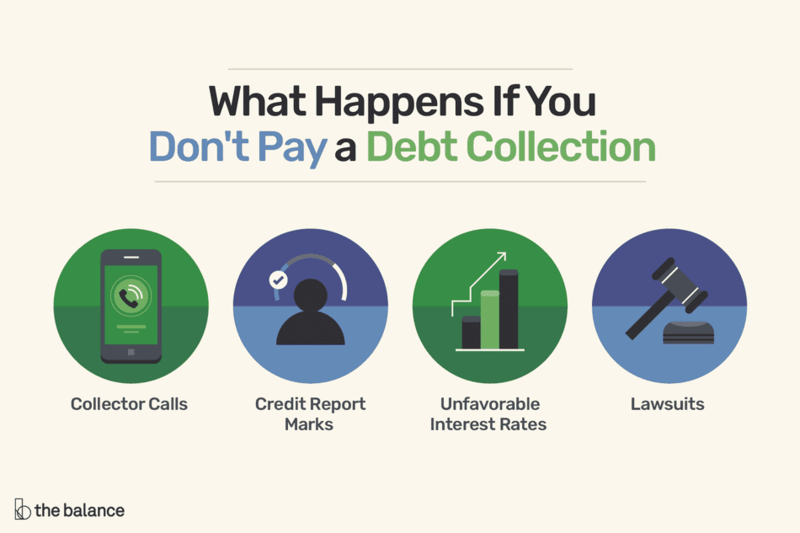 Are You Obligated to Pay Old Debt Collections?